The first-ever performance version Ford Explorer is on the way and is expected to debut at New York. 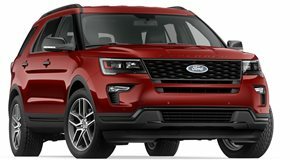 True to their word Ford has revealed their new high-performance Explorer, and as expected the new addition to the Explorer range employs Ford&apos;s 3.5-liter twin-turbocharged EcoBoost V6 engine. Dubbed the Ford Explorer Sport, this is the automaker&apos;s maiden performance-oriented SUV, which will come up against the likes of the Range Rover Sport and Dodge Durango R/T. "Adding an EcoBoost drivetrain to Explorer Sport delivers even more fuel efficiency and performance to the lineup. "This is our highest- performance, most capable Ford Explorer ever," said Bill Gubing, Explorer chief engineer. Coupled with &apos;more than 350 horsepower,&apos; the Explorer Sport brings projected fuel economy of 16/22mpg city/highway making it best-in-class in this regard. Ford says the Explorer Sport can sprint from 0-60mph two seconds quicker than a standard Explorer, so around the mid six-second range is expected. Power is sent to the 20-inch painted and machined alloys via a paddle-shifted six-speed SelectShift Automatic transmission with a unique 3.16 to 1 final drive ratio. A specially reinforced chassis makes for stiffer and more improved handling, while the Explorer Sport also gets a solid-mounted electric power-assisted steering rack with a faster ratio for enhanced responsiveness, high-performance brakes, and special terrain management systems. "By carefully beefing the chassis and suspension, precisely calibrating the Terrain Management System and adding comfort and convenience features, we&apos;ve delivered an SUV that delivers great dynamics and performance - while towing up to 5,000 pounds," said vehicle engineering manager Carl Widmann. Differentiating Ford&apos;s newest SUV from other models in the lineup is a unique grille with low-gloss Sterling Grey mesh and ebony high-gloss bars, blacked-out headlamp and taillamp treatments, black roof rack rails, sideview mirror skull caps and a liftgate applique. Customers can choose from four exterior colors of Ruby Red Metallic Clearcoat, White Platinum Metallic Tri-Coat, Tuxedo Black Metallic and Ingot Silver Metallic. The two-tone cabin gets Charcoal Black leather-trimmed sculpted seating, unique steering wheel stitching, illuminated scuff plates and Sport-logo floor mats. As the top-of-the-line Explorer, standard gadgets include a rear view camera, SYNC with MyFord Touch, a 12-speaker Sony surround sound system, and dual-zone temperature control. Options include dual-panel monoroof, active park assist, remote start, a power liftgate and intelligent access with Push-Button Start. Pricing has yet to be announced nor have details about where the new Explorer Sport will debut, although we suspect it will make an appearance at next week&apos;s New York Motor Show.